Amon san has been wishing to know the core of Bhutanese people’s “happiness” since the beginning of the journey. Therefore he has been keen to know about a national policy, which might be one of the reasons of Bhutanese people’s “happiness”. Thanks to Akane, working for Tourism Council of Bhutan at that time, Amon san got opportunity to have talk with Mr. Norbu Wangchuk from Gross National Happiness Commission (GNHC), Royal Government of Bhutan. GNHC is an independent commission which does not belong to any ministries or parties. Their role is to mainstream GNH into new policies &&undefined;&&undefined;undefined&undefined; plans by screening the policies and projects. Now please enjoy the talk of Amon san and Mr. Norbu Wangchuk from GNHC. Mr. Norbu Wangchuk：First of all, I would like to thank all of your team members to come to visit Bhutan this time. As you may know already, Bhutan is a small mountainous country in between two giant countries, India and China. Therefore we need exclusive and unique strategy for the development of the country. We identified two ways for the economic development. Amon san：What is the two ways? Mr. Norbu Wangchuk：One is the hydropower plant. Bhutan produces electricity by making use of the Himalayan natural rivers. The other is the sustainable tourism. Bhutan has unique tourism policy of “High value, Low impact” followed by minimum daily tariff system. Tourism can also help employment and can be important source of earning dollars. 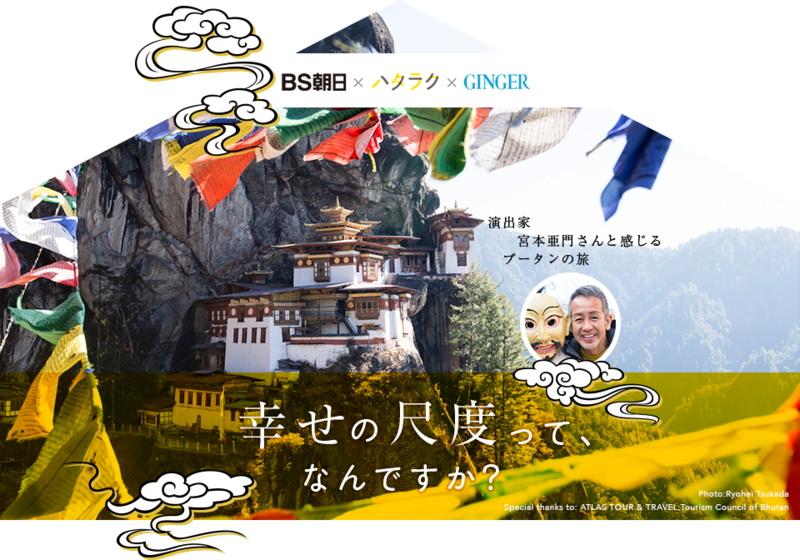 Amon san：The main purpose of our trip to Bhutan this time is to find the clue of “Country of Happiness” and “GNH”. His Majesty and the queen of Bhutan inspired us so much when they visited Japan in 2011. 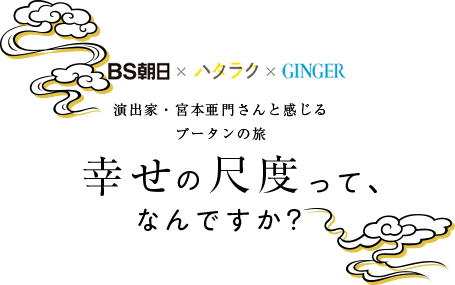 Now in Japan, so many people struggle to find the answer of this question: “Where is our happiness?” Though we are materialistically rich, so many people commit suicide. Now we know that the materialistic wealth will not bring happiness, however, we don’t know what to do next. In Japan, elder generations including politicians are still trying to follow and revive happiness brought the economic growth. On the other hand, some from younger generations have already realized that such consuming society will not bring sustainable happiness, however, even they cannot find the alternative way of society. This trip to Bhutan provided us some important clues. Now I feel that Bhutan is not just one of the developing countries but one of the most futuristic countries trying to find the new way of happiness and development. What do you think? Mr. Norbu Wangchuk：I strongly agree with you, Amon san. “GNH” is indeed the innovative concept introduced to Bhutan by Fourth King more than four decades ago. That time His Majesty stated that Bhutan aims for the improvement of not only GDP but also GNH and such philosophy brought shock to international society at that time. More elaborate and precise metrics to measure GNH has been underway since 2008 after Bhutan became the democratic country. For us Bhutan as a country, GNH is a “development approach that seeks to achieve a harmonious balance between material well-being and the spiritual, emotional and cultural needs of our society.” GNH is based on the belief that since happiness is the ultimate desire of every citizen, it must be the purpose of development to create the enabling conditions for happiness. Therefore any public services and government policies should also meet the goal of GNH. Amon san：It seems that goal of GNH and goal of the country’s development is the same. Mr. Norbu Wangchuk：We consider that the economic development is just the one factor to achieve happiness, which means the way to achieve each citizen’s happiness is not only the economic development. One’s spiritual well being, conservation of environment and culture are also very important pillars of GNH in addition to socio-economic development. Amon san：I have a question. There are no traffic signals in Bhutan despite the number of the cars in the country increases. Compare to other Asian countries, Bhutanese people drive more carefully as well. Is it because Bhutan is just undeveloped or because of government policy? Mr. Norbu Wangchuk：Since Bhutan’s development has just started slowly, Bhutanese people do not really require the traffic signals. We should rather utilize our government budget for more crucial issues such as poverty alleviation and social development. Bhutan still rely on assistance from donor country, so traffic signal is not a priority issue. Amon san：Oh I see. There are so many reasons. Mr. Norbu Wangchuk：Until 1960s, Bhutan has not opened our country to outside world. We came up our first five years plan quite recently in 1961 as a beginning of modernization. Therefore there were very less vehicles in Bhutan until 1990s and traffic signals have not been required. Amon san：So… Do you plan to put traffic signals in the future is the traffic becomes busier? What is your assumption? Mr. Norbu Wangchuk：Well, at the cities like Thimphu where the population is concentrated, indeed the number of the cars is increasing and traffic is becoming busier. Rather than introducing traffic signals to such areas, we think it is much better to introduce public transportation, the environmentally friendly public transportation. In my view, there are three benefits from this idea. First, Bhutan can reduce the amount of petro oil import from India. Secondly, air pollution will be reduced and we can contribute to the environmental conservation. Thirdly, Bhutanese people can save some money to purchase vehicles and fuel. Since the number of the cars in rural area is still limited, we consider that it is more important to develop public transportation service in the capital city, Thimphu. Amon san：That is a great idea. Mr. Norbu Wangchuk：Nowadays, the construction of apartment type residences is booming in Thimphu along with the increase of the population. I think this phenomenon is similar to Japan. There are around 10 households in one apartment building and each household has a car. Therefore the interactions between neighbors are becoming lesser and lesser these days. We are worried that the trustworthy relationships and networks among families, relatives and friends might be even weaker in cities like in Thimphu in near future. By developing public transportation, we think the community vitality will be strengthen because people greet, talk and communicate there. Amon san：Wow you are thinking that deep… I am really impressed. Then please tell me one more thing. This time in Bhutan, I was little surprised that even some monks are carrying mobiles and smart phones. Internet culture is spreading that rapid. I see that right now everything is still in harmony but how do you think about future? Any plans to regulate the usage of mobile phones? Mr. Norbu Wangchuk：Thank you very much for your concern. Until 1999, there were no proper infrastructures to watch neither TV nor internet in Bhutan. Our only entertainment is to watch Bollywood movies by VTR. Until now, Bhutanese government never control or regulate information from outside and number of TVs and mobiles. Amon san：His Majesty asked each and every Bhutanese national to take their own responsibility. That means he respects every citizen by letting them think by themselves. Is this something related to Buddhism? Will this be possible without Buddhism way of thinking? Mr. Norbu Wangchuk：Buddhism teaches us ethics and way of living just like being compassionate to others, so somehow there are relations. When we conducted GNH survey in 2010, it is proved that three factors (Physiological well being, Community vitality, Conservation of culture) out of nine domains of GNH index has decreased in Thimphu. We consider this as a result of TV and internet introduction. Amon san：Yes, I think it’s difficult to deny that relevancy. Mr. Norbu Wangchuk：On the other hand, mobile phone is very useful for the people of Bhutan, so government will keep on promoting the usage of mobile phone especially in remote area. Since Bhutan is such a mountainous country, sometimes it takes more than three hours to reach neighbor’s house at the next mountain especially in some remote area. It will be very convenient for rural people to communicate by mobile phone rather than walking and visiting neighbor’s house and community tie will be also strengthen. Especially for farmers, it will be very useful for government to let them know the market price status by mobile phone. Internet can me also great tool and reference for each and every Bhutanese citizen to make certain decisions. Amon san：It seems that everything depends on “how to use media” and “how to think about information they took”. I think Bhutan is such a precious country to have such an amazing king with strong and touching messages. I really would like Bhutanese people to treasure it and to spread it to the world. In Japan, now is the very important timing to proceed to the next stage of the society. I could find a lot of important clues this time in Bhutan. So… lastly, I would like to ask you how you think about Japanese people. Japan has developed quite wealthy in terms of materialistically and economically. However, not many Japanese people can say “I am happy.” without any doubt. We tend to looking for something “more and more” and we compare each other as well, then in the end people find themselves unhappy. How do you think about such Japanese people? Mr. Norbu Wangchuk：Actually I studied at Tsukuba University in Japan for two years, so I somehow have knowledge about Japan. First of all, I think Japanese people and Bhutanese people look very similar. However, the stage of the development is totally different between two countries. Japan has already developed economically, therefore there are always many choices and people can afford them only then they have sufficient money. That’s why some people may not be completely happy. Yet I think it’s all depends on individual’s way of thinking. As long as people can think “I am happy with what I have”, that’s it. This way of thinking is highly related with Buddhism. In Buddhism, “contentment” is one of the keys. In the end, it depends on individuals to be content with what we are. Amon san：Contentment… exactly it is! Mr. Norbu Wangchuk：Bhutan is now on the way of economic development. It can be said that Bhutanese people are getting opportunity to think and learn “what is the real happiness” through the concept of GNH. Other deference between Japan and Bhutan may be the way of moral teaching. In Japan, sometimes both parents go for work and there is no time for family to spend time together. In Bhutan, family tie is still strong and there are many occasions for relatives to get together. Ethical education based on Buddhism teachings at home or temple, which is dying in developed countries, also plays an important role. Amon san：Yes I totally agree. I feel importance of family tie, which Japan has been losing, here in Bhutan. Mr. Norbu Wangchuk：Thank you very much. By the way Amon san, there is one last thing I would like to share with you. Sometimes in Japanese media, Bhutan tend to be covered as “the happiest country in the world” or “Bhutan’s GNH is number one in the world.” However, our government never stated Bhutan as the world happiest country. Bhutan never tried to compare one’s happiness to others. GNH is the holistic approach to development. Therefore, I would really appreciate that if you all can understand that Bhutan is still a small developing country and there are many challenges we are facing as well. Under such situation, we are trying to achieve a harmonious balance between material well-being and the spiritual, emotional and cultural needs of our society. GNH is based on the belief that since happiness is the ultimate goal of every citizen, it must be the purpose of development to create the enabling conditions for happiness. Amon san：Yes, I understood. I also would like to achieve mental well-being together with Bhutan. Thank you very much for your precious time.